“Boxers or … ?” This question has plagued men for years as the struggle for optimal comfort continues. Some Boston-area viewers may have seen one of our new commercials on TV. The ad, shown above and linked here, has resulted in clients and non-clients alike asking why I did a commercial in my underwear. The simple answer is: I didn’t. In brief, these are athletic shorts not boxers. Those red things on my legs are not boxer shorts. They are athletic shorts from my high school alma mater, which have been with me since 1991 or so. The Rivers School in Weston, Massachusetts, has produced many great scholars and athletes. While I can say I received a terrific education, I can also confidently report that these shorts are the best legacy I have of my athletic accomplishments. Wearing these shorts on TV helps me illustrate that fancy suits don’t make a lawyer stand out; it’s about a proven track record of success. On top of that, the shorts are a subtle way of showing off my local roots. Did you think they were boxers or shorts? Did it make you laugh or cry to see me trying to cut through the legal noise you see on TV with a little humor? 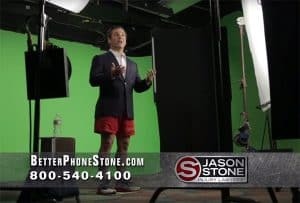 Attorney Jason Stone is the president of Jason Stone Injury Lawyers, a Boston law firm dedicated to helping injury victims recover the financial security they need to heal and move forward with their lives. A native Bostonian and the father of two, he wears pants while working.